There are more than 10,000 species of birds living on every continent on the planet. As a group, birds display incredible diversity in terms of lifestyle, morphology and habitat. There are birds that live in deserts and birds that live in rainforests; birds that fly 200 miles per hour and others that don't fly at all; and, while some birds weigh over 300 pounds, others only weigh a few ounces. Indeed, the only thing that unites all birds worldwide is a shared ancestry. The skies have not always been filled with birds. For millions of years, insects dominated the skies, followed by pterodactyls, flying reptiles similar to dinosaurs. Most scientists believe that birds evolved from a group of two-legged dinosaurs called theropods, though there are a few who disagree with the hypothesis and suggest that any resemblance between birds and dinosaurs is an example of convergent evolution. Despite disagreement about their dinosaur roots, it's clear birds originated within the reptile lineage. Though the obvious characteristic most envision when thinking of birds is flight, a number of birds have lost this ability over time. Ostriches (Struthionidae camelus), rheas (Rhea sp. ), kiwi (Apteryx sp. ), penguins (family Spheniscidae) and the odd cassowary bird (Casuarius sp. ), with its bony crest of unknown function, are all flightless. Most birds that have lost the ability to fly compensate in other ways. In the case of the ostrich, they have developed incredible running speed, achieving 43 mph in short bursts and maintaining speeds of 31 mph. In contrast, penguins aren't fast on land, but "fly" through the water with amazing speed and agility. The tiny Arctic tern (Sterna paradisaea) engages in an annual migration that stretches up to 44,000 miles. Over their 30-year long lives, these birds may travel a staggering 1.5 million miles as they migrate between food-rich polar regions. A 2012 study by Carsten Egevang, of the Greenland Institute of Natural Resources, has shown that the birds take a convoluted path between the poles. Egevang hypothesizes they take this route to avoid flying into the wind along their journey. The peregrine falcon (Falco peregrinus) is not only the fastest bird in the world, it's also the fastest animal. 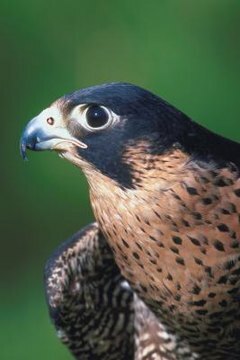 Peregrine falcons are small to medium-sized raptors with a 44-inch wingspan that catch birds in flight. The falcons will spot prey flying below them and make incredible dives to catch it, attaining speeds of over 200 mph in the process. Falcons were historically found throughout North America, but pesticide use, habitat destruction and hunting caused their numbers to plummet. Now recovering thanks to conservation efforts, these falcons have found new nesting sites that mimic the cliffs that they formerly used: skyscrapers.